Lord of the Rings. Mad Max. Star Wars. Indiana Jones… The Great Function Project. Another great trilogy comes to an end… well at least until the next one comes out. If you haven’t “seen” part 1 & part 2, go back and check those out in sequence. We’re two-thirds of the way through a co-development project to build a complete reference of every DAX, Excel & M function available to you. In part 3 today, we’re finishing it out by adding the NKOTB into the mix – M.
Yeah, M has its challenges when you’re starting out with it… Search Engine utilization being just one of them. We’ll resolve that one today so that you’ll never need to search for an M function again. Lack of Intellisense when writing M is another major one. Just like DAX and Excel, there is an expected syntax to M, but Power BI is not going to help you out with this – yet. We’re also going to improve that situation too by getting you definitions and examples of many of the functions. 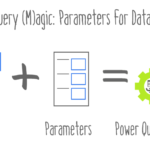 So click Edit Queries to enter the Power Query Editor, and we’ll get started. The M Formula Bar is disabled by default, so make sure you have it enabled. If you don’t see it go to the View menu, then check the box on the left that says Formula Bar. Yep, that’s it. One case-sensitive word gets you the complete library of M Functions – and some extras we’re not interested in right now. A list of names isn’t enough you say? Well, aren’t you getting a little spoiled now? OK, OK. We can do this, but to get the rest of the metadata that I know you want, that will mean writing a few custom M columns and doing a little cleanup. It’s about a 10 step process, so for the sake of time, we’ll take a shortcut and you can reverse engineer the details of this query once we’re done (spoiler: Value.Metadata is the magic function). Then copy the below code over whatever you have appearing in the Advanced Editor window then hit OK.
And now you have a complete listing of 674 M functions along with a decent amount of the associated metadata! There are a total of 12 M functions being used in this query (highlighted yellow) and you now have the resource to take a closer look at what they do. We’ve already created a lookup table to cross-reference DAX & Excel in Part 1. There’s no reason why we can’t add M to that lookup table, even though there is zero overlap. You’re probably going to run into errors at this step or on the refresh of the Function Lookup Table. The DAX query from part 1 is going to be the culprit. You’ll need to re-run DAX Studio and update the DAX query Source step with both the new local host and new catalog_name fields following the steps from part one here or here. To update your Function Lookup Table with the M functions. And we’re done. Hit close and apply and proceed to layout your complete Power BI & Excel reference in any way that works for you! We queried the metadata of a PBIX file (twice) even writing a little T-SQL along the way. We connected to SQL Server Analysis Services. We built a web scraping application. We performed some ETL – indirectly writing M in the process. We created a dynamic lookup table driven my 3 separate fact tables. We have written M and we’ve also “borrowed” some, both of which are fine. ….and you have done this using a free application with no traditional data sources in (hopefully) less than 30 minutes total! As much as this project was building up to the end product, we sure did get some reps in a lot of different techniques along the way! If any of this is new to you, I hope it’s demystified a few things for you. Did you find this article easier to understand than the average “tech” article? We like to think that is no accident. We’re different. First of a new breed – the kind who can speak tech, biz, and human all at the same time. 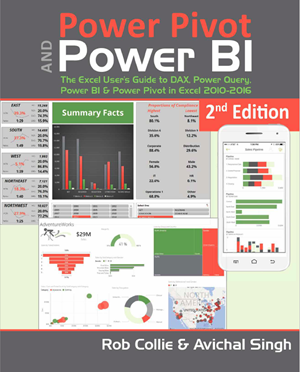 Want this kind of readily-absorbable, human-oriented Power BI instruction for your team? Hire us for a private training at your facility, OR attend one of our public workshops! Mat is a US CPA and Australian Chartered Accountant with 15 years’ experience across global financial services giants and bootstrapping startups alike. During that period, the Microsoft Power Suite became the secret weapon that allowed Mat to transition from competent finance manager to cross-functional CFO. A real life example of the career empowerment that can take place when a bean counter gets hands on with the analytics. I am still receiving errors. That being said, I reworked the query by adding ever single line by hand and using the UI where possible. I worked around the no columns found error by loading more data. Now that I have a “functional” dysfunctional query, it refuses to allow itself to be added the the look up table by saying a step in replaced value 5 interferes with a step in the original DAX table. My current end result is that I have the query functioning (not perfect as I had to add extra steps and complete it manually) but it isn’t playing nice with the others. I don’t know why it flagged so many innocuous things. Probably because it changes the quotation marks for HTML. Download the model that Reid provides and then look at the coding. I had to do the same. Cut the M-code to notebook and replaced all the HTML “” with the keyboard “”. Worked perfectly. Eight pages in all and combined these into a DAX ALL table with a Syntax guide where they were available. I then added a card in my visual with the following formula. Therefore when a DAX function is selected, the DAX Function name displays + Dax Description + Syntax example if available. If more than one item is displayed, then the card is blank. Actually, the =#shared is the only thing working for me. Everything else errors out. I copied and pasted. Then I replaced the quotation marks that were reversed. Then it wouldn’t move past the third line and flagged #”Added Type Column” as an error. Then I tried to add each line in individually but it broke at expanding Table.ExpandRecordColumn. I am giving up for now but this one just didn’t work for me. Specifically it says No columns were found. I had an issue with the quote marks, you need to replace all the formatted double quotes with unformatted double-quotes (took me a bit even with find/replace, there were a few different kinds), everything worked after that. There is something wrong with the code, because when I copied and pasted I got all kinds of errors. I typed each line exactly as written and while the query “ran” it certainly didn’t give the results I expected. Ok, now I got it, and I learned a lot in the process! Thank you for your great trilogy. Hopefully, you’ll emulate the inflationary tendencies of the “Indiana Jones” franchise and extend yours for at least 5 episodes (without us having to wait until 2020 for the 5th one). Has anybody ever found a way to get the original file name of the analysis services model you are connecting to? If you have multiple pbi desktop files open, DAX Studio seems to be able to list them. I have never been able to do this within Power Query. This would allow for automatic update of the connection parameters. You can already do this by getting the port number from the %localappdata%-folder, but if you have multiple pbi open, you will have multiple Workspace-folders, and there doesn’t seem to be a way to discover which is which. Where did the Function Group Excel come from and can we get a copy of that? I just downloaded the file and copied the table out of the file with the “Copy Table” function. Of course I still can’t get the lookup table to work but hey, I have a copy of that one if you want it. Thank you Kristi. That was very helpful. All set now. I can’t get this code to work. I tried replacing the multiple types of quotes with standard “”. I continue to get Token Eof expected errors. Hopefully they will fix and repost as I wanted to complete this function project. Apart from that, it’s a really nice project! Hi everyone, The html code has been updated. Thank you all for your patience! You should be able to copy and paste the M code now with no issues. Thanks for your great post but how can I find excel function group table as I don’t know how to find it. I get error function group table when I download Pbix file. DataSource.Error: Could not find a part of the path ‘C:\Users\MatHerring\Dropbox (PowerPivotPro)\Blog\Posts\BLOG – Matt Herring\Great Function Project\Part 2 – Excel\Function Groups.xlsx’. Is there any way to provide a step by step walk through instead of just the code? No matter what I do I cannot get past the line #”If there is more than one example take the first one”. The code works great up until that point. And yes, I’ve replaced every piece of punctuation – including typing out this whole line. I dont understand enough M to know what this line is trying to do, to recreate it in the UI interface instead.